CELEBRATING 11 YEARS WITH ZERO LOST TIME ACCIDENTS!. SouthWest Pipe Services focuses mainly on the removal of coatings from used “take-up” pipe. Our mechanical methods and processes can safely remove coal tar enamel/epoxy coatings at a rate of less than five minutes per 40 foot joint of pipe. Our machine has a conveyor system that turns the pipe as it carries it through the cleaning process. The conveyor moves the pipe into a fully contained area where a blade strips the coating material, all the while working under a filtered negative air pressure system to capture all potentially hazardous fibers. All material removed from the pipe is then automatically moved to a lined dumpster, never having to be handled or touched by human hands. Once the blade has removed the coating material, a high strength brushing system can polish the pipe to a NACE No. 2 or NACE No. 3 Visual Standard. After the job is complete the coating material is properly manifested and transported to an appropriate land fill. Asbestos Containing Material (ACM) and Polychlorinated Biphenyls (PCB) containing material is handled in accordance with all local, state and federal regulations and guidelines. SouthWest Pipe Services is the only company specializing in pipe cleaning that handles ACM in accordance to NESHAP regulations. The only requirement is that the pipe is straight enough to be handled by the conveyor system. 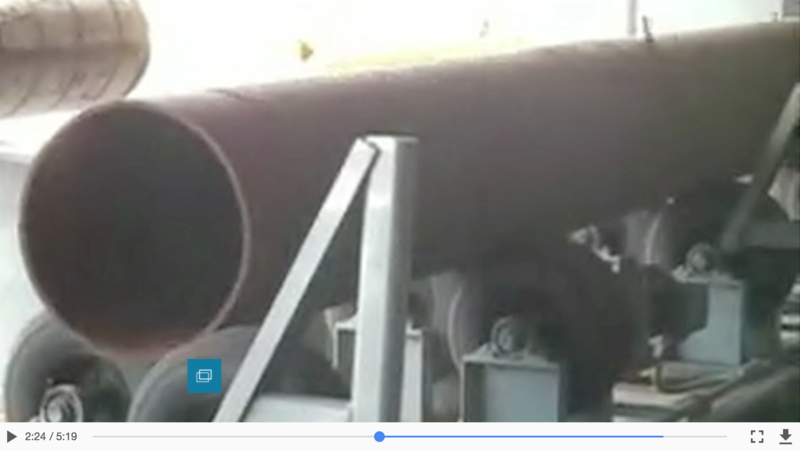 If the pipe has a bend and is not able to travel our conveyor, material is removed by hand. If the coating material contains asbestos, it is removed by one of our licensed specialists using the proper personal protective equipment (PPE). Copyrights © 2017 All Rights Reserved by Southwest Pipe Services.